There's something to be said about that specific genre of cinema that is reserved for giant creatures fighting other giant creatures. They don't let trivial things like lives, geography or logic come in the way of the important stuff - attacking each other and smashing buildings. Take Godzilla, for instance. Japan's love-hate relationship with the monster aside, in this film, he is pegged as the savior against two bug things which live on radiation and want to mate. Well, one bug thing lives in Tokyo where Joe Brody (Bryan Cranston) is looking for answers to what caused the nuclear meltdown that killed his wife a coupla decades ago. The other bug thing lives in San Francisco where Brody's son Ford Brody (Aaron Taylor-Johnson) lives with his wife Elle (Elizabeth Olsen) and son Sam (Carson Bolde). So, anyway, Joe gets caught trespassing the "quarantined" area that is his former home, so the cops call Ford to come and bail his old man out. Ford goes to the now shutdown reactor which has been turned over to scientists studying the MUTO (Massive Unidentified Terrestrial Organism), aka bug thing, that is slowly being gestated to life by the nuclear-powered earth. Just when dad and son are in the middle of demanding to be let off, stuff happens - electricity flickers a lot, something breaks, slime falls on someone, a monster breaks free, and within 5 minutes Walter White, we mean, Bryan Cranston, is dead. The military has a plan. Call Godzilla, get the two MUTO - one in Tokyo and the other in San Francisco - together, get all three fighting, and then nuke them all. Dr. Ichiro Serizawa (Ken Watanabe) has other plans, though. "Let them fight," he says inscrutably, all the while mumbling about the natural order etc. etc. The monsters are quite gloriously ugly, exactly how monsters older than prehistory spawned from the Earth's radioactive bowels should look. 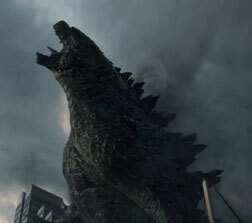 Godzilla is his most resplendent yet, and the MUTO even move wonderfully. But then, there are the people. Dr. Serizawa had the right idea about letting the creatures fight, an idea the makers should've borrowed by not putting any people in the film. Not a single human character in the movie is useful in any way, with Ford Brody's character going so far as to distract us from the main plot. The performances by everyone are good, but as we just mentioned, really superfluous. The graphics beat the screenplay by a mile, while the background track matches the action on screen beat for beat. All in all, you will enjoy this one if you aren't expecting a story, or anything even approaching coherence. If you lockdown firmly all your brain's attempts at logicking, then the monsters will leave you with a spectacle you will treasure for a long, long time. 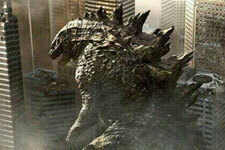 Be the first to comment on Godzilla (Telugu)! Just use the simple form below. fullhyd.com has 700,000+ monthly visits. Tell Hyderabad what you feel about Godzilla (Telugu)!